About once a month I get a reminder from my editor, which typically runs along these lines: “We’re carrying your next column on the 15th. Remember, it’s news-you-can-use we need". It’s therefore with a flutter of trepidation that this month I reveal my unfashionable devotion to one quirkily wonderful, utterly useful “old". I’ve always been a sucker for playing with antiquated equipment, but the Pentax has gone where no vintage lens has gone before: firmly into my essential kitbag. It focuses down to within 10cm of the front element, offering the heady possibility of shooting at a 1:2, half life-size ratio. In other words, with a little tweaking, it’s a macro lens waiting to happen. I searched online and found a cheap metal adaptor that would allow me to modify the lens for my SLR body, turning the fiddly Pentax screw mount into a Canon-compatible snap-in. Then I let my $20 “hackro" loose on the flowerbeds around the house. What followed was a revelation. I was a paparazzo in the world of bees and butterflies. I discovered worlds in which tiny droplets of water on iris fronds became as heavy and palpable as solid crystal balls. Best of all was the meditative, exploratory nature of macro photography: Nothing tunes one’s mind into the wonders of nature better than trying to do them justice in pixels. If you’re used to autofocus and image stabilizers, there’s an inevitable learning curve to getting critically sharp images from manual lenses; practice is the way to success. Fortunately, light metering is a snap: I just set the camera to Aperture Priority mode and stop the aperture down to the setting I want. The camera’s meter automatically registers the changing light and adjusts shutter speed accordingly. 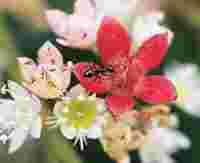 At extreme magnification, margins for error become almost non-existent: The tiniest flicker of wind can turn your careful composition into a mess of colourful streaks, while working with tiny depth-of-field means you need a rock-steady hand to stay in focus. When I can’t use a tripod, I employ a quick-and-dirty workaround: Set the camera to shoot in bursts of six, and hope that one will be in focus. This trick might net me one sharp image in 12 exposures. My macro methods might be unorthodox, but the results tell their own story. Having been rescued from the scrapheap of history, my little “hackro" has produced an entire calendar of flower images, as well as a modestly successful line of gift cards. It’s also given me new reasons to shoot on rainy days, and has fundamentally changed the way I think about buying equipment: Why spend a fortune on brand new glass when you can pick up brilliant optics for the price of a good lens cap? The old might just be news again. Beginnings: in my first efforts at macro, such as this shot of an Australian Greviilea flower, I was content to make illustrative images. As I became accustomed to the close-up world I began to look for more graphic images: this shot of a Kangaroo Paw makes use of the flowers unfurling petals and the harmonious interplay of green and red. Curving lines lead the eye to the focal point of this image: water drops on an iris petal. The strong triangular shape reflected in the droplet provides an interesting note of tension. Water droplets clinging to petals and leaves produce some spectacular effects, but watch your exposure to avoid blowing out the highlights. This droplet seems to float above the surface of the leaf on which it rests. David Stott is a writer and photographer based in Australia.